Through the generous support of Well Fargo, The Florida Literacy Coalition (FLC) manages the Florida Financial Literacy Initiative. This statewide program provides target educational services to adult education/literacy, ESOL (English for Speakers of Other Languages) and family literacy programs and students. This initiative supports the integration of literacy and math instruction and financial education. Financial education promotes stability for individuals and their families. The more people know about credit, banking services, taxes and basic money management, the more likely they are to increase savings, buy homes, save for education and improve their financial well-being. Not surprisingly, people with a low level of education often also have low numeracy and financial literacy skills. Basic financial skills education can be critical to helping such individuals manage their money and protect themselves from predatory practices. Family Literacy in DeSoto County began with a Barbara Bush Family Literacy grant that was submitted through DCEF in 2001 . The program was located at Nocatee Elementary School but after 3 years moved to its current location at the Family Service Center. During the previous school year, the program served 20 families which included a parent/caregiver and a child. The academy offers families hope for a better life. 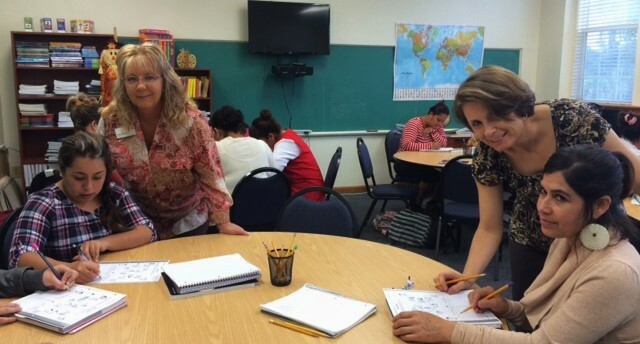 The adult students are committed to working hard to learn English, reading and writing skills, parenting tips and they take courses to help them pass the GED. With their young children in tow, parents have a place to learn, and start down the path of achieving the American dream. If you would like to see a remarkable program in action, call the Family Service Center at 993-1333 to schedule an appointment. You may also make donations to continue the work of this program by GIVING to the foundation.